Sure You Want To Change That? There’s a problem with advertising campaigns, and it’s one that very few people in the industry care (or dare) to talk about. It’s that – often – advertisers change their advertising because they’re bored with it. Or their agency is bored with it. Or because a new advertising manager or a client’s new agency don’t have the guts to say “Actually, there’s not much wrong with that”, and suggest just a minimal change to an existing hard-working campaign. They fear being seen as unimaginative. And very often, they throw the baby out with the bathwater and change advertising LONG before the public has tired of it. Ask any agency head or creative director over a quiet glass of wine one day, and so long as you promise not to name them publicly they’ll confirm it. We have made a fetish of originality. And originality is often a really good thing, no question. But there’s also plenty of good solid evidence to support patiently evolving your advertising rather than instituting a wholesale revolution. There are a number of reasons for this, and they can all be debated. But the first should be blazingly obvious. Consumers “learn” ads, and become attuned to good ones, over time and multiple viewings. But when you change the content dramatically you create dissonance and have to start from the beginning again, no matter how many millions of dollars you have invested in creating consumer understanding. • We identified 109 new campaigns that were launched by our clients’ competitors despite the fact that research results indicated the old campaign was still working. Of these, further exploration identified 28 cases in which a marketplace-based reason supported the switch. (For example, in one case a competitor had introduced a major new product that threatened to redefine the category.) But that still left 81 cases, or 74% of campaigns, that were replaced for no good reason. These were cases in which personnel or agency changes, or simple boredom on the part of the decision-makers, appeared to have driven the change. • Of this group of 81, most new campaigns failed to generate results that were on par with those of the old campaign. In fact, by the end of their first year, only 20% of new campaigns were performing as well or better than the existing campaign. Do you like those odds? The same rule applies to product development and packaging. Do you want to be the marketing manager who came up with a new taste for Coke? Or how about the marketing manager of Tropicana juice who produced lovely new modern packaging only to see sales plummet 50% in five weeks, losing $60 million, and a rapid switch back to the old pack. So is this an argument for just continuing to do the same stuff again and again and eschew originality altogether? No, of course not. It’s an argument for being very careful about what you change, and not changing stuff for the sake of it. Indeed, it’s an argument for what used to be the holy grail of advertising agencies and their clients, to wit, to find a genuine CAMPAIGN idea – one that can evolve over time, refreshing the creative elements but not replacing them, and bringing the public along for the ride. Knowing what to change requires smart strategic thinking, sensible consumer research, and buckets of good old-fashioned commonsense. Why spend millions establishing a great campaign idea in the public’s mind, only to throw it away because someone needs to be seen to be being creative? Great ad campaigns (as opposed to great one off ideas) are legendary, because they build businesses in every market sector. “Heineken refreshes the parts other beers cannot reach.” was one such. “Probably the best lager in the world.” for Carlsberg was another. And even when they changed to “That calls for a Carlsberg …” they kept the single word “Probably” on the packaging. “Finger licking good” for Kentucky Fried Chicken was another brilliant campaign, even though it translated as “eat your fingers” in Chinese. Ok, they evolved the name of the business to KFC to get away from the horrid word “Fried”, but Finger lickin’ good is still right up there next to the drawing of Colonel Sanders. And good on them. Arguably, Commonwealth Bank should never have changed from “Which bank?”, and so on and so on. Beanz Meanz Heinz still works so well for Heinz after 50 years that last year Heinz partnered with retailers to mark the 50th anniversary of the famous slogan by updating its iconic packaging with limited-edition labels. Fifty different iterations of the catchphrase Beanz Meanz Heinz were generated from consumers' associations with Heinz Beanz. 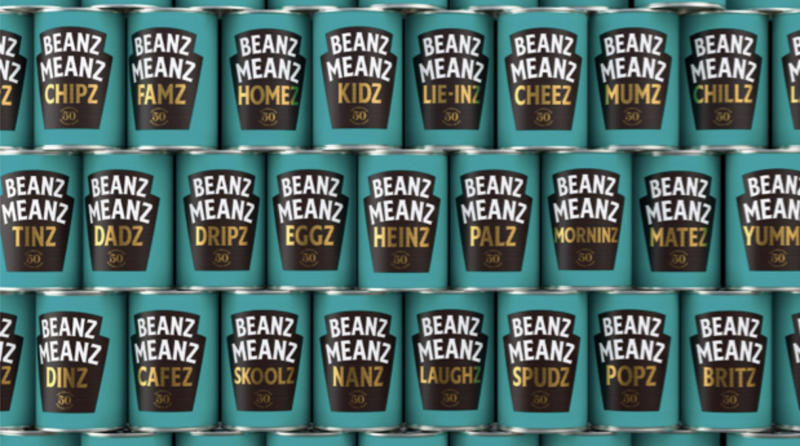 These variations included "Beanz Meanz Mumz", "Beanz Meanz Eggz" and "Beanz Meanz Palz" now emblazoning tins. And they even produced 50 special limited edition tins priced at a whopping ten pounds a tin, signed by the original creator of the slogan, Maurice Drake. In all these wonderful examples, the clients and the ad agencies evolved a brilliant core idea, sometimes for a generation or more. The strategy survived changes of marketing personnel, changes of creative teams, and changes of ad agencies. So before you send out that next brief – or your response to it – just pause for a moment to consider this great and timeless piece of marketing wisdom.